Join local author and host Pati Digh in a discussion of Farwell, Fred Voodoo by Amy Wilentz. Amy Wilentz is a tremendously talented and original writer, described by Susan Orlean as having “a sharp eye, a cool wit, and a reporter’s gumption”—all of which are handsomely on display in, Farewell, Fred Voodoo (Simon & Schuster). 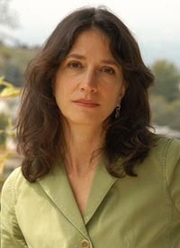 She writes regularly for The New Yorker and The Nation and has been the recipient of the Whiting Writers Award, the PEN Martha Albrand Non-Fiction Award, and the American Academy of Arts and Letters Rosenthal Award. She teaches in the Literary Journalism program at U.C. Irvine. Like Joan Didion’s Salvador and Rory Stewart’s The Places in Between, Farewell, Fred Voodoo vividly portrays the people of a stark place. Simply put, this is a brilliant writer’s account of a long, painful, ecstatic—and unreciprocated—affair with Haiti, a country that has long fascinated the world. Her book is about magical transformations. It is filled with raucous characters: human-rights reporters gone awry, movie stars turned into aid workers, musicians running for president, doctors turned into diplomats, a former U.S. president working as a house builder, street boys morphing into rock stars, and voodoo priests running elections. Wilentz looks back and forward at the country: at its slave plantations, its unthinkable revolutionary history, its kick-up-the-dirt guerrilla movements, its troubled relationship to the U.S., the totalitarian dynasty that ruled for decades, as well as its creative culture, and its ancient African traditions and attitudes. With Farewell, Fred Voodoo, Wilentz pursues the heart and soul of this beautiful and confounding place. On the heels of the third anniversary of Haiti’s devastating earthquake, award-winning author Amy Wilentz (1989’s acclaimed The Rainy Season and the new Farewell, Fred Voodoo) chronicles the country’s dramatic history, rich culture, and long relationship with the United States. Amy Wilentz is currently considered a "single author." If one or more works are by a distinct, homonymous authors, go ahead and split the author. Amy Wilentz is composed of 1 name.